80s clothes were the ultimate in neon clothing and outrageous hair cuts. Being bold and outrageous was the fashion. There are some real fun 80′s outfits for women which have great colors and shine. 80s fashion seems have began reappearing again in lots of stores and on the runway. Legwarmers were very much an 80s clothing icon. An elongated tube of knitted cotton (or daycron/polyester blend, as seemed to be the preferred concoction), the legwarmer was worn scrunched down on the calf and onto the ankle, over the shoe. Whether or not the leg needed to be kept warm didn’t really matter. You looked cool with leg warmers in these 80s clothes. Clothing and fashion for the 80s had to include Scrunchies They were created fashionable locks for the plain ponytail via a ‘scrunched’ tube of material. The fabric shell covered a circle of elastic and protected the hair from getting twisted in the thin rings. No more tangled, twisted hairs caught between the rubber of old elastic hairbands, or hair pulled to a headache-inducing tightness. A fashion-forward apparel company, Benetton found incredible success in the U.S. when the lure of Eurochic wooed the 80’s. The company capitalized on the growing obsession with both European style and social awareness, creating clothes in bold colors and sophisticated shapes. Clothing for bicycles changed in the eighties. The problem with bicycle shorts was that they left nothing to the imagination. Whether in shiny spandex or soft cotton lycra, the snug fit was like a second skin. Undeterred from wearing the slim shorts, the athletically challenged solved the problem by layering a long and baggy t-shirt over the most vital areas. All hail the mighty t-shirt from the 1980s. wow! that totally takes me back! the 80s was such an awesome era and i feel really lucky to have grown up during that time. Anyone remember the jeans brand “closed”? no I never heard of them either. They were made of Denim cotton, normally stretch flare & wide-leg with five pockets weren’t they? Does anyone remember the “Lotto” brand shoes?? They had interchangable colored patches you could change to match what you were wearing… I LOVED THEM !! What a great memory the “Lotto” brand. I forgot all about them – were they the Italian sports wear company? I love the 80’s and collecting jewelry and sunglasses to go with my threads. 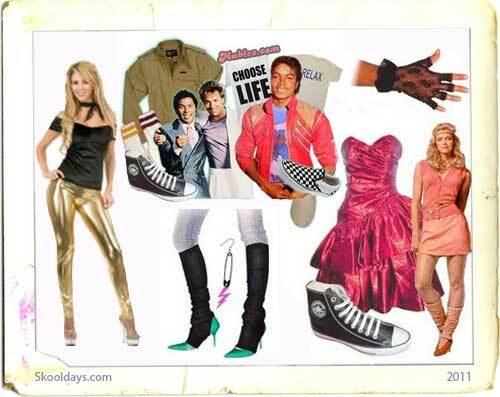 Guess jeans, Esprit clothing, Reebok hi-tops, slouchy socks, banana clips….I could go on and on. LOL! I sooo miss that time period. Does anyone remember the Second Image make of jeans from the 80s? I thought they were so cool! And Tukka boots? I wore mine to a party when I was just 14; I felt so grown up! I was googling tukka boots and came across this….i’m 49 now and would love a pair of tukkas! So comfy, i wore the heels and soles completely off mine. I had pale grey suede proper ‘Tukka’ boots…little pixie boots with drawstrings and the Tukka label on the cuff. They were lovely…v well made and quite expensive for the time. I think I had mine for Christmas 1981!